My husband, Will, is a man's man. He goes fly fishing for hours upon hours by himself in the middle of nowhere, has chopped down several trees and built our kitchen from the drywall up. He also grows massive amounts of facial hair, just because he can. Will has always had scruff of some sort. When I first met him, he had a goatee, which lasted until we had children. In retrospect, I think the weight of becoming a father prompted the growing of the beard. Short and trimmed at first, although I know he cringed with every comparison to Mitchell from Modern Family. To be completely honest, I have always liked men with facial hair. And Will's is such a unique shade of reddish-orange. Sure, there were a few awkward phases when I contemplated cutting it all off while he slept. There was the month or so that the right side had a perpetual swoop. And the whole mustache thing creeped me out a bit at times. Not to mention finding long, wiry beard hairs in the bathroom sink every morning. But, all in all, I liked the beard. And then there was the silent competition with Will's dad. I know that every time his father reminisced about his own beard of days gone by, saying, "I think mine was a little bit longer," it reenergized him. Nothing spurs determination in a man like a competition with his father. 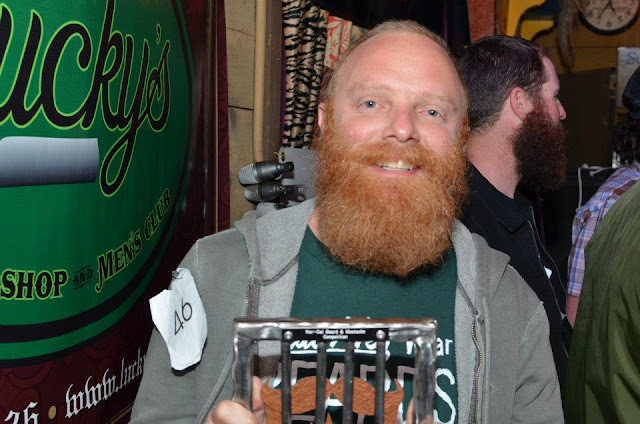 A few weeks back, Will registered for the Northern California Beard and Mustache Competition, in the full beard under twelve inches category. But, as the competition date quickly approached, Will began to back pedal. Was it really long enough? Would he be laughed off the stage? Plus, I know his stomach churned at the idea that some might view this pursuit as showy. You see, Will is not typically a front and center kind of guy - he prefers being behind the scenes. He is, however, the kind of guy who dedicates himself to a plan of action and does not look back. He has embraced these past six months wholeheartedly. And for that, I am proud of him. This might seem ironic because he was the one that came up with this crazy pie project in the first place, but Will is not a big fan of pie. He politely taste tests for me when asked, but does not put in requests or sneak into the kitchen for a sample. In fact, he is not a big dessert guy in general. What he is a big fan of lately is beer - specifically craft beer. And red meat, especially since we largely cut it out of our diet last summer. So, what to make a beer and meat loving manly man? 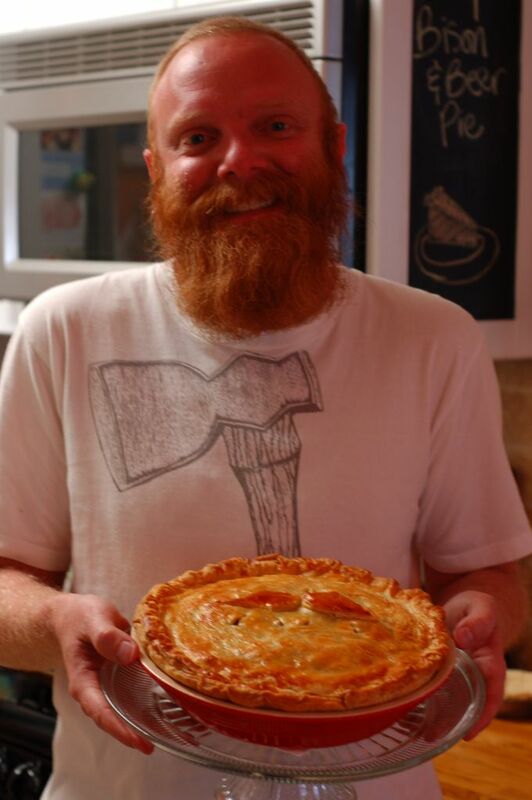 How about Bison and Beer(d) Pie? 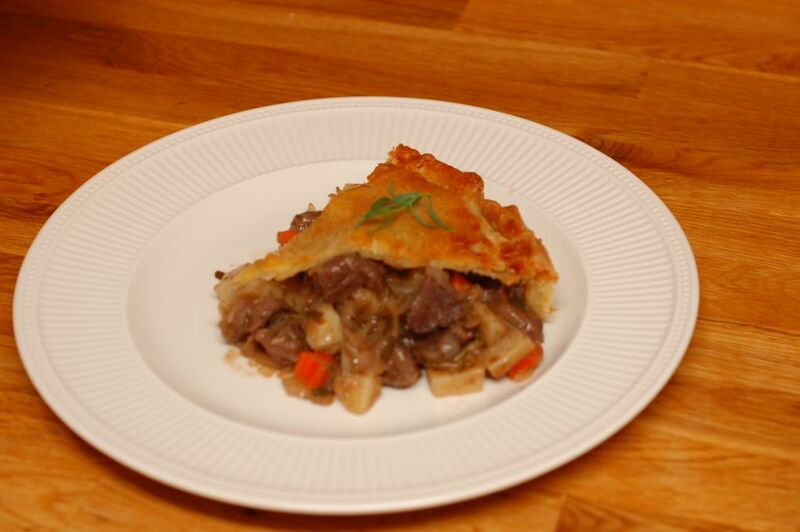 The most important ingredient in this savory pie was clearly the bison. So, I packed up the boys and headed over to the local meat market, which is always an education in manliness. I mean, there are several guys just standing around in bloody aprons. Kind of intimidating if you ask me. 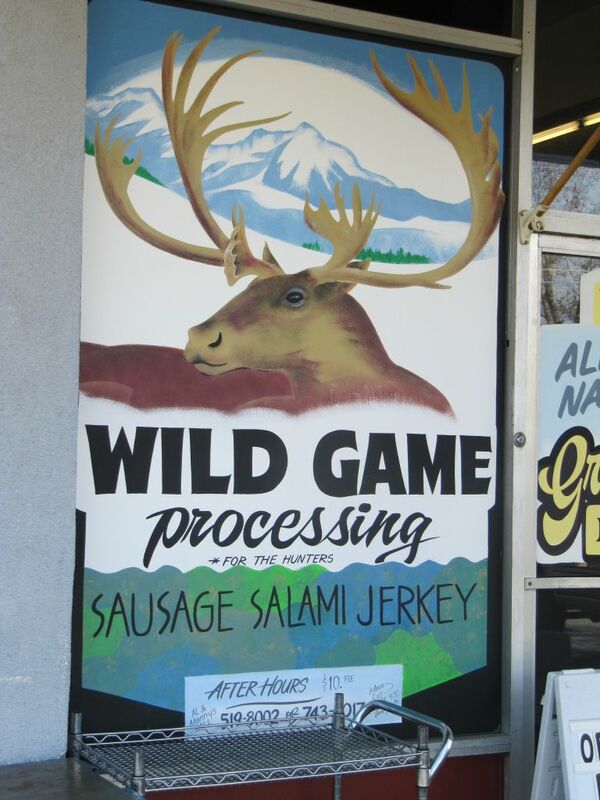 The butcher directed me to their case of frozen game meats and proceeded to tell me that I was not going to find better or fresher bison in all of town. Well, who was I to argue? I left the market with a pound of bison and a package of applewood smoked bacon. Plus, the boys each got a lollipop, so all of the men in my life were covered. Once home, I defrosted and then seared the bison meat on the stovetop in a bit of olive oil. Then for the produce. I peeled and diced several small red potatoes. 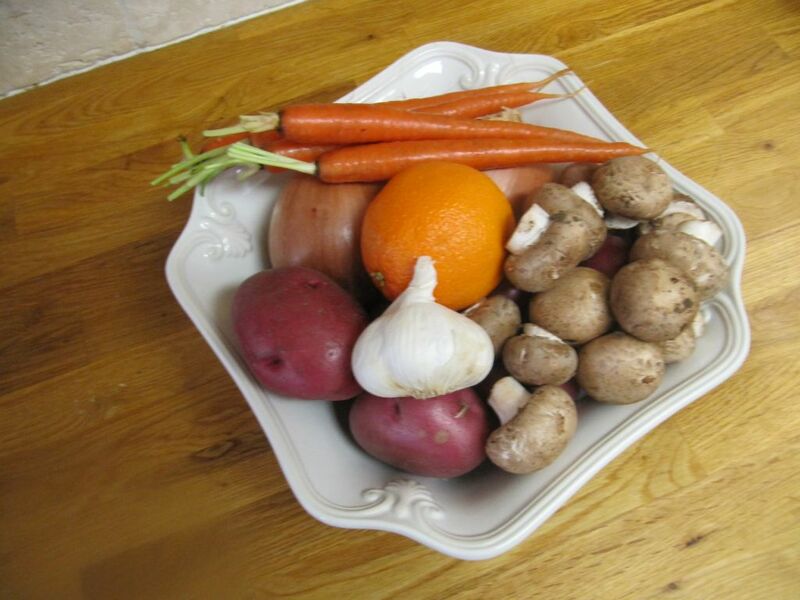 While they were steaming, I chopped and sautéed onions, carrots and garlic until tender. 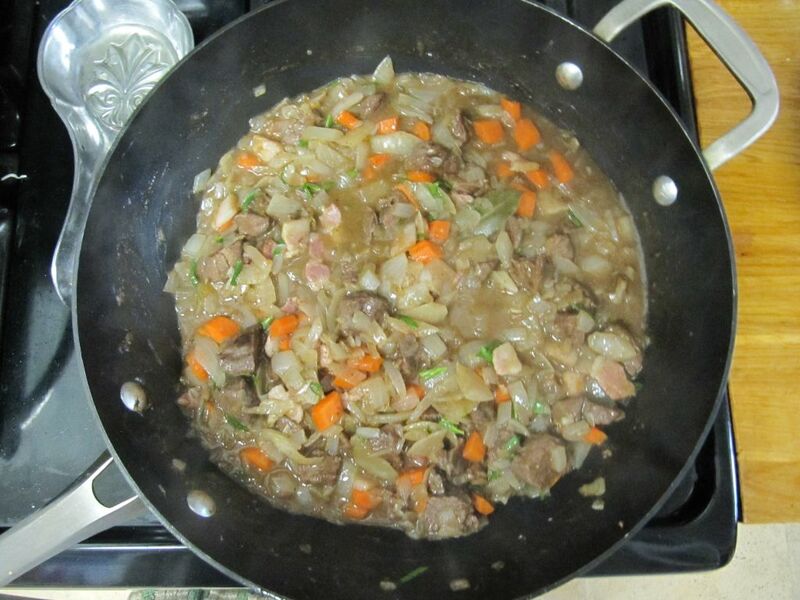 After all the individual components had been prepared, I combined everything in a large skillet with chopped tarragon, a bay leaf, the juice and zest of an orange, a generous dollop of horseradish mustard and about a third of a bottle of Guinness. The rest would be served alongside for dinner. I sprinkled in a spoonful of flour to thicken the gravy and let the whole pan simmer uncovered for about 25 minutes. While the filling cooled, I prepared the puff pasty crust. 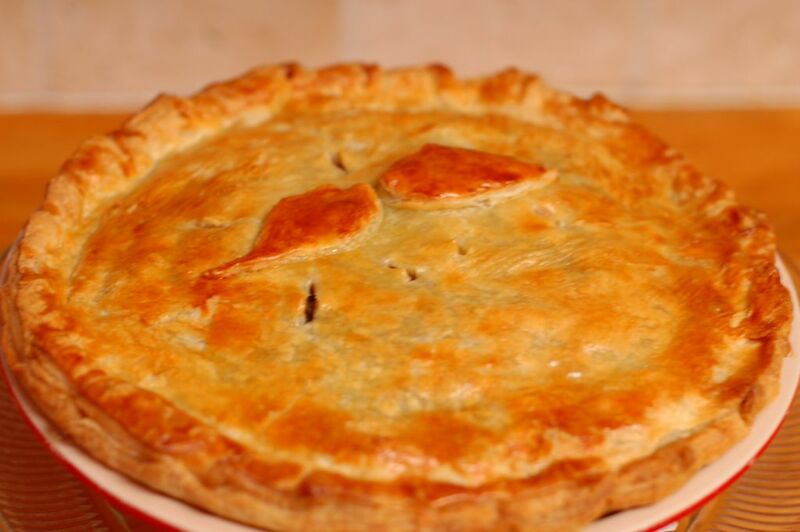 I admit it - I bought prepared puff pasty for my first foray into savory pie. I consider this my first official "cheat" since beginning this pie endeavor, and I am not proud. But, I was on a tight timeline - trying to complete the pie before the boys awoke from nap and Will came home from work. Plus, I was slightly daunted by a new type of crust. 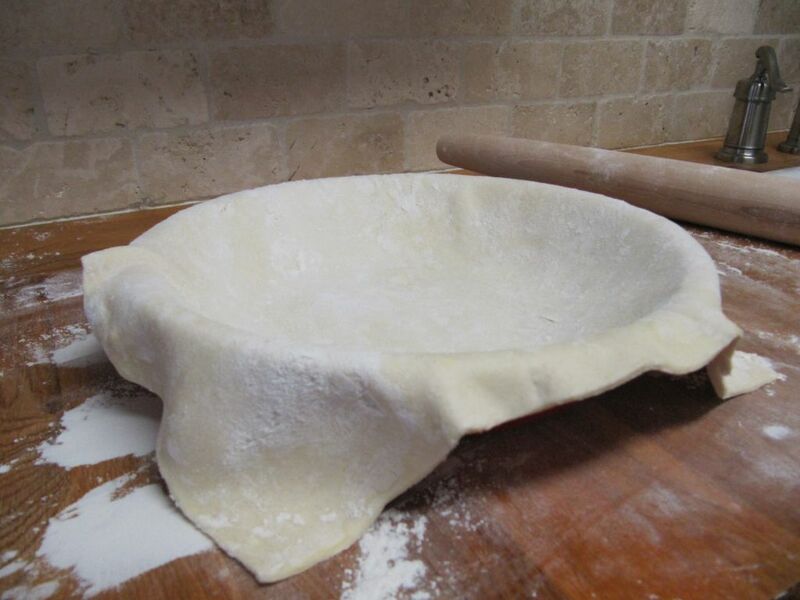 So, I floured the good old cutting board and rolled out the pastry to fit the pie plate. I was giddy to use my new red Le Creuset pie dish. All of my previous pies had been baked in disposable tins to be given away. But, this one was a keeper. I placed the bottom crust in the buttered pie dish and trimmed the excess dough to about a half inch overhang. Then, I loaded in the filling. I wasn't sure it would all fit - it looked like quite a lot. But, success! I carefully placed the remaining crust on top and pinched the edges together to seal. But how to decorate a manly pie crust? 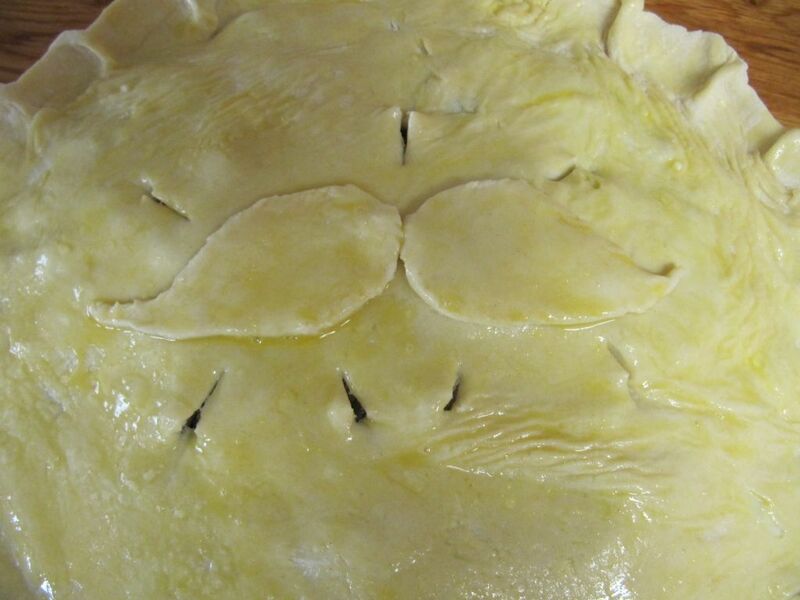 I settled on a mustache cut from the remaining scraps of dough. Pretty cute if I do say so myself. 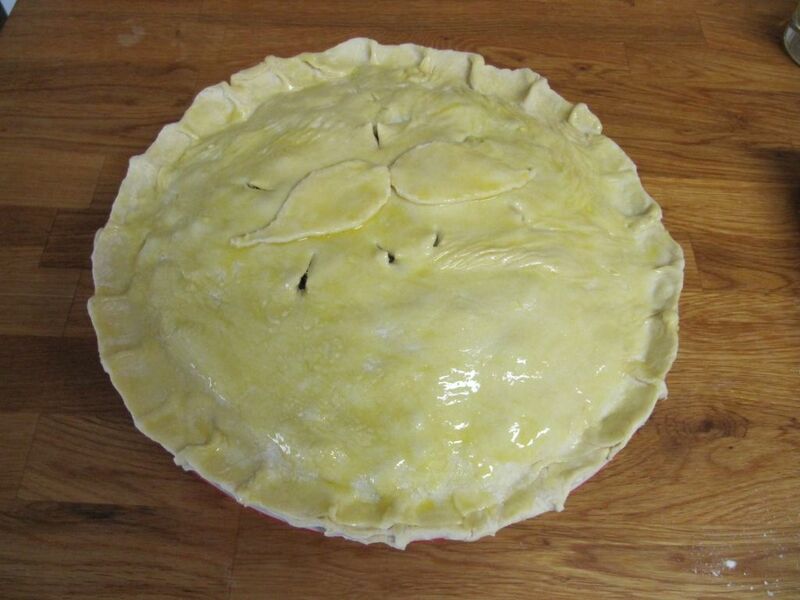 I cut a few slits for ventilation and brushed the entire pie with an egg wash. Into the oven for 40 minutes and out came a lovely little Bison and Beer(d) Pie. Will was genuinely surprised by this pie! Largely because I usually harass him to go out to eat on Friday evenings. And also because I don't think he thought his name was in the pie rotation. Which is silly because when I think about the people in my life who deserve a "thank you" via pie, my husband is certainly at the top of the list. Well, I am happy to announce that my first savory pie was an enormous success! 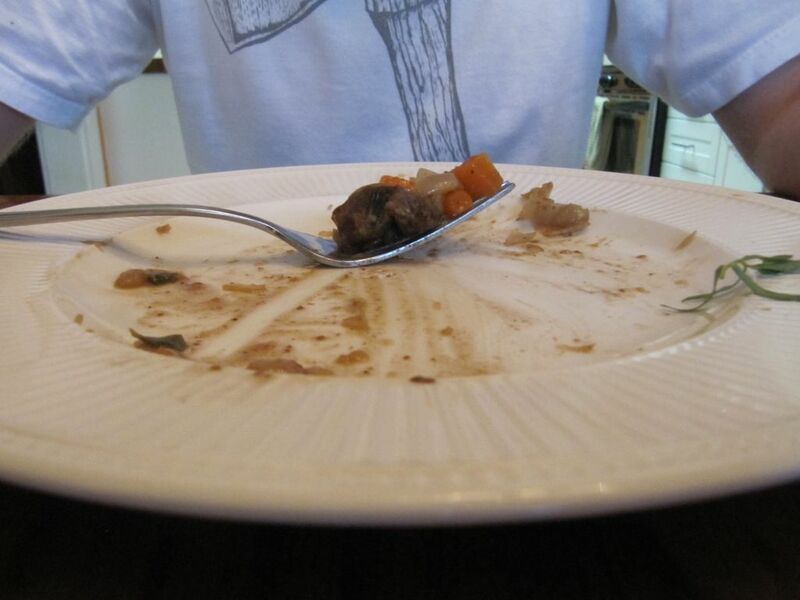 Will devoured his first slice, went back for seconds and then just took his fork to the entire pie dish. I will take that as "yummy." And the beard competition turned out to be a huge success as well! Undoubtably aided by the manly meal eaten the night before, Will stole third place in the Northern California Mustache and Beard Competiton's full beard under twelve inches category. A few beers, some close friends cheering him on and pure dedication brought home a victory. And a nice little trophy to boot! Hi Erin, just read your blog, nice going. I started my blog in August 2011. It is a memoir for my children going back coming to America in 1959 and how my cooking became a career! Perhaps you want to check it out some time. I will keep reading yours. Love the Bison pie. I have the greatest wife in the world! What wife supports her husband growing a ridiculously large beard, only one I know. This is just who she is, she supports my ridiculousness and makes me a better man for it. Thanks baby, I love you.